Even more telling, though, were comments by second baseman DJ LeMahieu, who was candid in expressing his doubt that his camp and the Rockies will even hold talks. “No, there have been no talks and I don’t think there will be,” said LeMahieu. The 29-year-old LeMahieu, a two-time Gold Glove winner and All-Star, is set to hit the open market at season’s end. While they didn’t call a great deal of attention to it, the Giants beefed up their analytics department over the offseason, writes Alex Pavlovic of NBC Sports Bay Area. San Francisco has become more aggressive in terms of infield shifting and, during Spring Training, displayed leaderboards with more modern metrics such as exit velocity in the clubhouse. Giants players have begun to ask for additional info on their launch angles and batted-ball tendencies, Pavlovic notes. Regarding the infield shifts, Pavlovic also points out that the addition of a strong defensive player in Evan Longoria, plus the increased emphasis on data, figures to make the club considerably more aggressive in terms of shifts. Preller also said that the Padres are looking for a veteran middle infielder that can provide depth for shortstop Freddy Galvis. San Diego was checked in on Alcides Escobar earlier this winter, and in my view he would appear to still be an option given the lack of known interest in Escobar’s services. 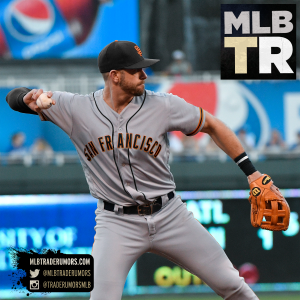 Evan Longoria shared some interesting details about his trade to the Giants in an appearance on the MLB Network on Friday (as detailed by MLB.com’s Daniel Kramer). Though Longoria didn’t have any leverage in the form of no-trade protection or 10-and-5 rights, he said he “kind of gave them [the Rays] a short list of teams that I thought would be a good fit for me,” specifically teams that “were going to be committed to winning, year-in and year-out.” It isn’t known how much, if at all, Longoria’s list factored into Tampa’s decision-making, though the Giants were one of the teams included. The Cardinals, another club linked to Longoria in trade rumors, were also on the third baseman’s list. Longoria said he felt a trade was coming after a talk with Rays GM Erik Neander two weeks before the Giants deal was completed. There hasn’t been as much talk about an eventual extension for Paul Goldschmidt as in past offseasons amongst Diamondbacks executives, which makes Nick Piecoro of the Arizona Republic wonder if the team is “subtly preparing for the possibility of life without Goldschmidt. Not that they’re expecting to move on; just that they might have to.” Goldschmidt is slated to earn $11MM in 2018 and the D’Backs hold a $14.5MM club option for 2019 that seems like a lock to be exercised. While the first baseman has posted superstar numbers over his career, Piecoro notes that the D’Backs will have to weigh the value of committing a huge salary to Goldschmidt in his age-32 season and beyond, especially when Zack Greinke is already taking up such a big chunk of Arizona’s payroll. The Reds are amid “serious discussions” with free agent reliever David Hernandez, though an agreement isn’t imminent, Zach Buchanan of the Cincinnati Enquirer reports. Cincy isn’t the only team after the right-handed Hernandez, per Buchanan, who notes that the Reds are also interested in other free agent relievers and aren’t necessarily limiting themselves to one-year deals as they look to improve their bullpen. On the heels of a strong 2017, Hernandez is seeking a multiyear pact, according to Buchanan. The recipient of a minor league contract last offseason, the 32-year-old Hernandez went on to toss 55 innings of 3.11 ERA ball and notch 8.51 K/9 against 1.47 BB/9 with the Angels and Diamondbacks. The Cubs and third baseman Kris Bryant haven’t engaged in long-term extension talks this winter, president of baseball operations Theo Epstein told Patrick Mooney of The Athletic on Friday (subscription required/highly recommended). The two sides avoided arbitration Friday when Bryant agreed to a $10.85MM salary – a record amount for a first-time arb-eligible player. While Bryant won’t become a free agent for at least four seasons, Nationals superstar right fielder Bryce Harper could hit the market next winter. If Harper does become a free agent, Bryant informed Mooney he “would love” for the Cubs to sign him. The two have been close friends since childhood, which could help the Cubs if they attempt to recruit Harper. The Cardinals’ current plan for their 2018 bullpen includes deploying the newly signed Luke Gregerson as their closer, president John Mozeliak told Derrick Goold of the St. Louis Post-Dispatch and other reporters on Saturday (Twitter link). They also plan to heavily rely on left-hander Tyler Lyons and get contributions from righty prospects Jordan Hicks and Ryan Helsley. Of course, with the season still a couple months away, the Cards could pick up another established reliever(s) to swipe Gregerson’s ninth-inning role in the coming weeks. They’ve been linked to the likes of Alex Colome and Addison Reed this offseason, though the latter came off the board Saturday when he agreed to join the Twins. In another tweet, Goold relays that the Cardinals turned their attention to Rays righty Chris Archer and third baseman Evan Longoria after acquiring outfielder Marcell Ozuna from the Marlins last month. The talks between the two sides “weren’t fruitful,” Goold writes. Longoria is now out of play, having gone to the Giants in a late-December deal, though Archer remains one of the Rays’ prime trade candidates. 10:04pm: The Associated Press reports that the Rays will pay $14.5MM to the Giants and are responsible to the $13MM that is yet owed to Span. Specifically, the Rays will pay $2MM to the Giants by the end of 2017 to cover Longoria’s $2MM trade bonus, and they’ll also pay another $3MM by Oct. 31, 2022. The remaining $9.5MM, per the AP report, will be deferred in payments from 2025-29. In essence, then, the Giants are adding $60.5MM to their long-term ledger in order to acquire the final five years of Longoria’s contract. Moreover, it doesn’t appear that San Francisco will take much of a hit at all in terms of the luxury tax. So, when paired with the shedding of Matt Moore’s contract, the move should afford the team ample opportunity to add at least one outfielder on a multi-year deal while remaining comfortably south of the $197MM luxury tax threshold. 7:30pm: Marc Topkin of the Tampa Bay Times reports (via Twitter) that the Rays will send between $10MM and $15MM to the Giants to cover a portion of Longoria’s remaining $86MM as well as a $2MM trade bonus. 11:51am: The Rays and Giants have agreed to a deal that will send Evan Longoria to San Francisco. Young infielder Christian Arroyo headlines the return, with veteran outfielder Denard Span going along with him to offset some of Longoria’s salary. Young pitchers Stephen Woods and Matt Krook are also bound for the Tampa Bay organization. In addition to taking on Span’s contract, Tampa Bay will ship an as-yet-unknown amount of money to the Giants. The 32-year-old Longoria is owed another $86MM between now and 2022, including a $5MM buyout on a $13MM option for the 2023 campaign. He will also receive a $2MM assignment bonus. Just how much of that will end up on the Giants’ books remains to be learned. The precise cash exchange has yet to be reported. Plus, there’s a bit of uncertainty surrounding Span’s future obligations. He is owed $9MM for 2018, along with a $4MM buyout of a $12MM mutual option for the ensuing season. Those obligations seem destined for San Francisco, but it’s not yet clear what’ll happen with the remaining $3MM signing bonus payment owed to Span in one month. For both organizations, there’s quite a bit of risk in a transaction involving Longoria. The Giants are taking on a high-priced player who struggled to a career-low .261/.313/.424 batting line in 2017 — adding to a collection of costly, aging veterans. But the Rays are parting with the long-time face of the franchise. If Longo can bounce back, the rewards could be significant. His days of top-level offensive production are likely in the past, but Longoria was a .273/.318/.521 hitter as recently as 2016, when he also swatted 36 home runs. Of course, that followed two less-than-excellent campaigns, so the overall trajectory of late has framed Longoria more as a solidly above-average hitter than an excellent one. That said, it’s important to bear in mind that Longoria has also long delivered value with his glove. Though Defensive Runs Saved had observed a downturn of late, it credited him with a substantial bounceback (+11 runs) in 2017. Despite the tepid offensive output, then, Longoria contributed 3.6 rWAR and 2.5 fWAR in 2017. In return for Longoria, the Rays will get not only salary relief but also some young talent. Arroyo is the chief piece here. He had a messy MLB debut and missed time due to injury in 2017, but is only 22 years of age and destroyed Triple-A pitching in a limited sample in the just-completed campaign. In the best-case scenario for the Rays, Arroyo may be able to compete for a job out of camp. Span’s inclusion is mostly about cost. Still, he remains a useful player even as he closes in on his 34th birthday. In 2017, Span slashed .272/.329/.427 with a dozen home runs over 542 plate appearances. Though he’s no longer really capable of regular time in center and has battled through core and hip injuries in recent years, Span ought to be capable of at least average work in a corner spot and has long been a productive baserunner. Padding the return here for the Rays are a pair of interesting young arms. As Eric Longenhagen of Fangraphs tweets, both have quality stuff that still remains to be harnessed. The 22-year-old Woods just threw 110 innings of 2.95 ERA ball at the Class A level, with 9.2 K/9 against 5.2 BB/9. The righty is considered a relief prospect, as is the left-handed Krook, who will play the coming season at 23 years of age. Krook was unsigned as a first-round pick in 2013 and landed with the Giants as a fourth-rounder in 2016. Over his 91 1/3 frames at High-A in the just-competed season, Krook worked to a 5.12 ERA with 10.3 K/9 and 6.5 BB/9. For the Rays, this move may be a precursor to further action. The club has been in talks on closer Alex Colome all winter. Many anticipate the team will trade a starter, with star Chris Archer representing the most intriguing possibility. Replacing Longoria with Arroyo means there’s arguably still some excess infield depth to work from. And Span could either be used as a part-time player or sent elsewhere to realize further cost savings. The Giants, meanwhile, still have needs and will be looking to fill them without going over the luxury tax line. It seems this swap won’t impact their spending capacity too significantly, since the average annual values of the two contracts involved aren’t too far apart. But the move takes one outfielder out of the equation while filling the gap at third, possibly leaving the Giants still searching for both a center and corner piece. Marc Topkin of the Tampa Bay Times first reported Longoria was going via trade (via Twitter). Jeff Passan of Yahoo Sports (links to Twitter) and Robert Murray of Fan Rag (via Twitter) reported the other pieces involved. Murray was first to note on Twitter that the sides had struck a deal, with Jon Morosi of MLB Network (Twitter link) and Ken Rosenthal of The Athletic (Twitter link) mentioning the key names involved. Over the weekend, Marc Topkin of the Tampa Bay Times reported that the Giants had some level of interest in Rays third baseman Evan Longoria, and following up on that report, USA Today’s Bob Nightengale tweets that the Giants have “keen interest” in swinging a deal for the Tampa Bay cornerstone. However, in order for any deal to work, Nightengale notes that the Giants would need the Rays to take the contract of either Hunter Pence or Denard Span back from the Giants in addition to whatever prospects San Francisco would send. Taking on either of those contracts would be a fairly tall order for the cost-conscious Rays. Pence is entering the final season of a five-year, $90MM contract and is owed $18.5MM in 2018 — more than the $13.5MM that Longoria is set to take home this coming season. Obviously, taking on Pence’s deal would still provide the Rays with long-term cost savings — Longoria is owed $86MM over the next five years — but the short-term complications in that scenario are readily apparent. Taking on Span’s deal would be closer to a cash-neutral proposition. He’s owed a $9MM salary plus a $4MM buyout in the coming year, though he will also reportedly be paid a deferred $3MM from his signing bonus come Jan. 20, 2018 as well, so even that scenario could require the Rays to take on some additional 2018 dollars. Of course, if the Rays are to take on any salary in return, even a portion of one of those two deals, that’d give GM Erik Neander, senior VP Chaim Bloom and the rest of the front office greater cause to increase their ask in terms of prospects from a Giants system that is thin on upper-tier talent. At his current price tag of five years and $86MM, the 32-year-old Longoria isn’t exactly teeming with surplus value, though he remains a quality regular option at the hot corner. Longoria hit .261/.313/.424 with 20 homers last season — the weakest offensive output of his career — but delivered excellent defensive marks at third base, leading to a season that was worth roughly three wins above replacement. The ever-durable Longoria has only missed 12 games since the start of the 2013 season and hasn’t been on the DL since 2012, though the downturn in his offensive profile in 2017 could create some cause for trepidation. Longoria’s ground-ball rate skyrocketed to 43.4 percent as his line-drive, fly-ball and hard-contact rates all fell. His infield-fly rate, meanwhile, trended upward for a fourth straight season. Whether Longoria’s 2017 downturn was an aberration or the beginning of a decline remains to be seen but may also be a moot point in this instance. The Rays likely don’t relish the idea of taking on a negative-value asset in order to trade a player that has been the face of their franchise for nearly a decade, but the Giants can’t take on the $16.7MM luxury tax hit would accompany Longoria’s contract without pushing perilously close to the $197MM tax barrier. San Francisco wants to avoid paying that tax for a fourth straight season and would love to reset its tax penalty — they’re currently set to pay a 50 percent tax on every dollar over that point this offseason and in subsequent years — making the Longoria scenario seem to be something of a reach. If the Rays plan to trade Longoria at all, however, this would be the offseason to do it. He’ll gain 10-and-5 rights early in the 2018 season, which would provide him full veto power over any proposed trade. The Astros and Phillies have interest in Rays right-hander Chris Archer, joining a slew of previously reported clubs, per Marc Topkin of the Tampa Bay Times. The Rays clearly wouldn’t have any trouble finding a taker for Archer, thanks to his track record, age (29) and team-friendly contract (four years, $34MM). Teammate and face of the franchise Evan Longoria, the Rays’ longtime third baseman, is three years older than Archer and costs far more (a guaranteed $86MM over a half-decade). But that doesn’t seem to be a prohibitive price tag, as the three-time All-Star is drawing some interest from the division-rival Yankees as well as the Giants, Mets and previously reported Cardinals, according to Topkin. The offer the White Sox made to the Orioles for third baseman/shortstop Manny Machado did not include second baseman Yoan Moncada or rightyMichael Kopech, Nick Cafardo of the Boston Globe writes. It would’ve been a surprise to see the rebuilding White Sox consider parting with either player for only a year of control over Machado. The 22-year-old Moncada and Kopech, 21, were the crown jewels in the package they received last winter for Chris Sale, after all. Moncada, whom the White Sox promoted last July, will be their second baseman from the get-go next year. The flamethrowing Kopech reached Triple-A in 2017 and now ranks as MLB.com’s 10th-best prospect. While righty Jake Odorizzi represents another Ray who could be in a different uniform in 2018, teams aren’t having an easy time prying him out of Tampa Bay. The Rays have let potential trade partners know they’ll have to “extend” for a shot at Odorizzi, Mike Berardino of the Pioneer Press tweets. Odorizzi, who will play his age-28 campaign in 2018, is under control via arbitration for two more seasons. He’s projected to earn a reasonable $6.5MM next year. 11:53am: It seems St. Louis is still not fully zeroed in on Ozuna — or, at least, not just Ozuna. In addition to some pitchers to whom the club has been tied previously, the Cards still seem to have some possible interest in Rays third baseman Evan Longoria, Rosenthal tweets. And Bob Nightengale tweets the team is “optimistic” of scoring at least one significant hitter with the possibility of another. He also cites Longoria and adds Blue Jays Josh Donaldson as a player who is “in play” for St. Louis, though certainly most indications to date have been that Toronto has little interest in trading him. 11:22am: The Cardinals and Marlins are “making progress” on a deal that would send outfielder Marcell Ozuna to St. Louis, according to Ken Rosenthal of The Athletic (via Twitter). These organizations have been tied in chatter of one kind or another for much of the offseason. We heard yesterday that the Cards were the favorites to land Ozuna. As of that time, though, there were multiple other suitors reportedly still involved and the Cardinals were also eyeing fellow Miami outfielder Christian Yelich. It is still unclear just how things might come together, but there are quite a number of possible ways the sides could line up. The Cardinals have a host of young outfielders, potentially offering Miami a direct replacement with greater future contract control, along with the sort of youthful pitching that the Marlins covet. As for Ozuna, he’d be the major stick the Cardinals have sought all winter. While he’s not at the level of former teammate Giancarlo Stanton, he did post an excellent .312/.376/.548 slash with 37 long balls in 2017. And Ozuna is also much friendlier to the checkbook, as he’s projected to earn $10.9MM in his second-to-last season of arbitration eligibility. That relatively light payroll hit might leave the Cards with capacity to make some other impact additions via free agency. Shohei Ohtani received a platelet-rich plasma injection in his right elbow in October, Sports Illustrated’s Tom Verducci reports. The treatment was simply “a preventative measure,” in the words of Ohtani’s agent Nez Balelo, who added that PRP injections are commonly used in such a fashion in Japanese baseball. Teams were made aware of the treatment during Ohtani’s recruitment process, and the two-way star underwent a physical to confirm his health to any interested clubs. One team official said that the PRP information “didn’t change the equation” about Ohtani’s value and potential. The Angels are still weighing the possibility of using a six-man rotation next year, though GM Billy Eppler told reporters (including Jeff Fletcher of the Orange County Register) that they’ll make their decision before Spring Training. Using a sixth starter would provide extra rest for the rotation, which is no small concern given how most of the Halos’ starters have undergone significant arm injuries in recent years. In Ohtani’s case, pitching in a six-man rotation would more closely resemble his regular schedule in Japan, while also allowing him more time to recover from getting at-bats as either a DH or outfielder when he isn’t on the mound. Eppler suggested that Los Angeles could also use J.C. Ramirez as a reliever and frequent spot starter, rather than a full-on six-man rotation. The club still plans on a seven-man bullpen, so if the six-man rotation idea comes to fruition, that will leave the Halos with 13 pitchers on the roster and one less spot available for a bench player. With a shorter bench a possibility, the Angels will be focused on adding a versatile player that could fill more than one of their remaining needs (backup shortstop, fourth outfielder, and right-handed hitting platoon third baseman). “I always put a premium on flexibility, but it might be a little bit more now,” Eppler said. Fletcher suggests that Eduardo Nunez or Freddy Galvis could be fits for the Angels in terms of handling multiple duties. “Some industry chatter” has identified the Angels as a potential trade partner with the Rays for Evan Longoria, according to Marc Topkin of the Tampa Bay Times. It isn’t yet clear if the Rays will even be shopping their longtime star, though if they did, it would take a shift in the Halos’ thinking for them to pursue Longoria. Beyond the financial cost (Longoria is owed $81MM through the 2022 season), the Angels were planning to use Luis Valbuena and a right-handed platoon partner to handle the hot corner, while focusing more attention on their more pressing need at second base. Adding Longoria as the everyday third baseman would create a logjam for first base/DH playing time between Valbuena, Ohtani, Albert Pujols, and C.J. Cron, though potentially Valbuena or Cron could be dealt, maybe even as part of a Longoria trade package.